The internet connection in the internetcafe is not the best quality, unfortunately. So after a good deal of 'denial-and-error' we found the ideal situation that actually works! 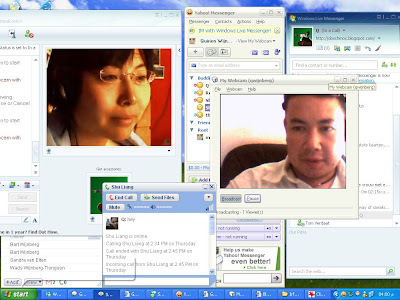 Talk about multitasking: we use GTalk to talk, MSN to look at Shu's webcam and Yahoo to look at mine! For some reason neither program lets us do everything at the same time!